This is one of the coolest runs in San Juan — it is simultaneously a historic tour of the old city and a gem of a seaside path along the Bar Channel. 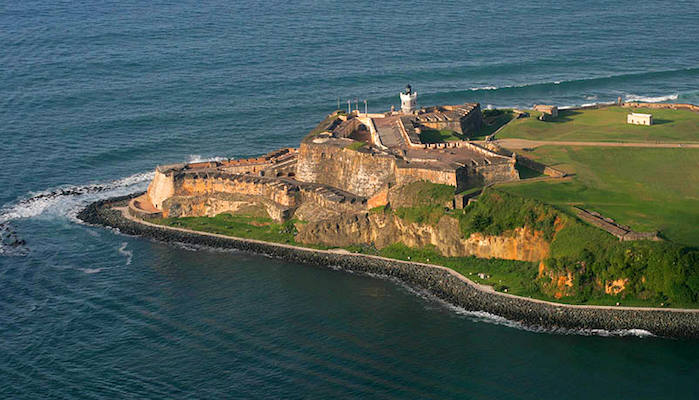 It follows a route from along the Paseo del Morro — a promenade built in 1853 with shady trees, cafes & the monumental Raíces Fountain– to the Punta del Morro on the extreme end, home to the San Felipe del Morro fortress, which once guarded San Juan’s port. A simple out and back is 2.2 miles. Once out at the fort, you can add another 1/2 mile loop, to the Castle Del Morro, and the Bastión de San Antonio, along Calle Del Morro. Add-On Option- Historic Part of Old San Juan: For a longer run, create your own route along the narrower streets of Old San Juan. Run along the commercial Calle de la Fortaleza; by the landmark Catedral de San Juan Bautista, second oldest in the Americas; the Plaza de Almas; and the pretty side streets. Best at less crowded times.